Pacific West has recently launched new improved formula, Cheezy Fish Fillets last month. Since Mommy Jane and Little Angels are cheezy lovers, we bought 2 packets of Cheezy Fish Fillets to try it out. Besides that, Mommy Jane also bought a packet each of the Tempura Fish Fillets, Calamari Ring, Baked Fish Fillets and Tempura Prawns since it is year end school holiday now and need to cook more often for my Little Angels to eat. Pacific West range of products are carefully developed by a team of Culinary Chefs and Food Technologists to add value and enrich consumer lifestyle since it is convenient where we could prepared the cooks within minutes, direct from freezer to fryer/oven. Their continuous creation of new products offering us a variety in options and taste. Besides that, Mommy Jane love their quality with premium choice of seafood and ingredients that comply with international food safety and process standards with BRC, IFS, HACCP and YUMI accreditation. For Muslims, all Pacific West range of products had HALAL certificate. Sometimes Mommy Jane need to be creative to make the food that we bought as delicious as possible. Since my Little Angels love to eat egg yolk, Mommy Jane had used Cheezy Fish Fillets to make Cheezy Fish Fillets with Salted Egg Yolk which is Mommy Jane's own recipe. Mommy Jane choose Pacific West Cheezy Fish Fillets for this dish because it is delicious, nutritious and diverse and we will make good things greater with their latest Cheezy Fish Fillets. 1. Fried the Pacific West Cheezy Fish Fillets till gold coloured is achieved and set aside the fish. 2. Heat the oil and add the curry leaves. 3. Once the curry leaves are fried, set a side for later use. 4. Add the chopped garlic to the oil in the wok. 5. Saute briefly till softened and add the red chillies. 6. Stir and add the butter. 7. When the butter has melted, add the salted egg yolk and stir. 8. You will notice that it starts to become creamy first and then frothy. 9. Stir vigorously till the sauce is smooth and creamy without allowing it to split. 11. Remove from the wok and serve immediately. 13. This Pacific West Cheezy Fish Fillets with Salted Egg Yolk can be serve over a squeeze of lemons to add a great flavour to the fish. It can be eaten as a side dish for noodles and rice. 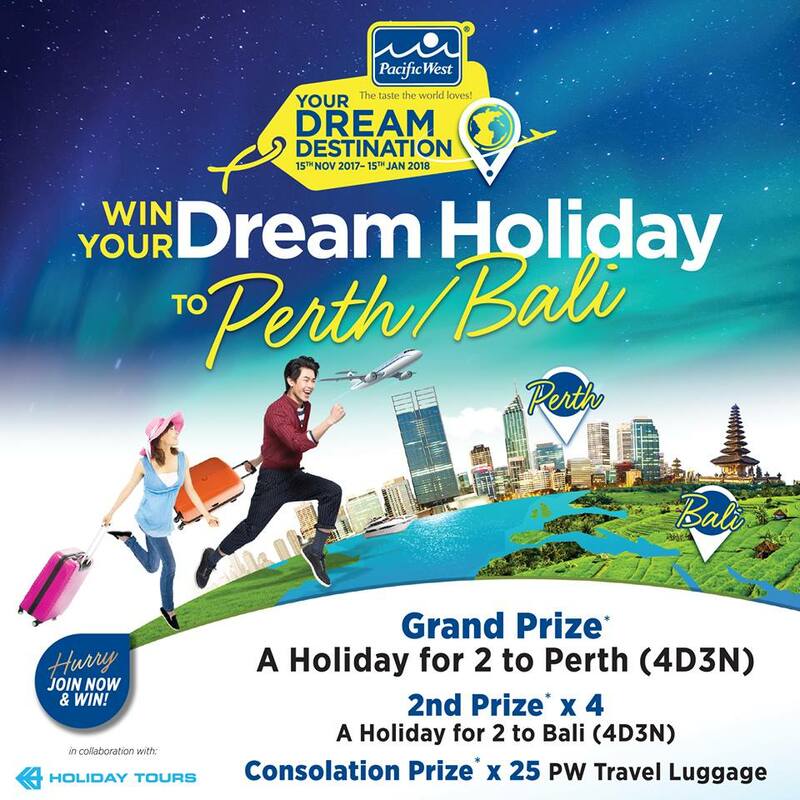 In conjunction with the new improved Cheezy Fish Fillets launched, Pacific West had collaborated with Holiday Tours & Travel Sdn Bhd (Penang Office) to bring us the "Win Your Dream Holiday" contest which had started on 15th November till 15th January 2018. 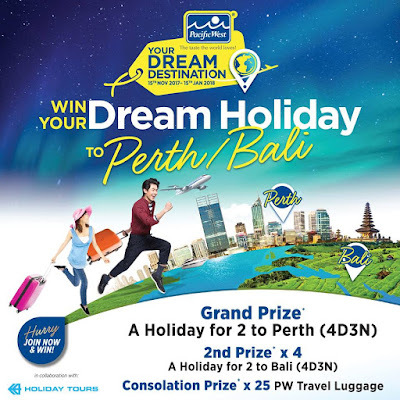 Just purchase a minimum of any one (1) pack of Pacific West product, we stand a chance to experience the riverside capital of Western Australia, Perth or the famed island of the Gods, Bali for 4 days 3 nights. For more information, do log on to their website at www.pacificwestfoods.com and their facebook page at www.fb.com/PacificWest.my. Pacific West Cheezy Fish Fillets with Salted Egg Yolk is simple and easy to cook and yet it is yummylicious. Me and my children love the dish very much. It is cheezy inside and with the delicious sauce of the salted egg outside. Nice to have it together with rice and my Little Angels could finished a bowl of rice with only Pacific West Cheeezy Salted Fish Fillets as the dish and Mommy Jane had add some fresh long beans which is perfectly paired with the dish. Ezna, memang sedap. Anak-Anak I suka makan. Siti, do try it out and I'm sure you will love it too. Nampak sedap. Produk pacific west memang best. Tapi harga pon boleh tahan jugak. Afizah, do stock up your products and try the Cheezy fish fillets. Oooh. Looked good. I seldom buy frozen fish fillets. I mist try this brand. Rose, once try, you will love the taste. Enjoy your cooking with Pacific West too. Iffah, hope you had enjoyed your fish fillets now. JMR, memang best and convenient too. Do try it out.